The first studio of fourth year was the Comprehensive Design Studio, which incorporated studies in structure, mechanical systems, and code. 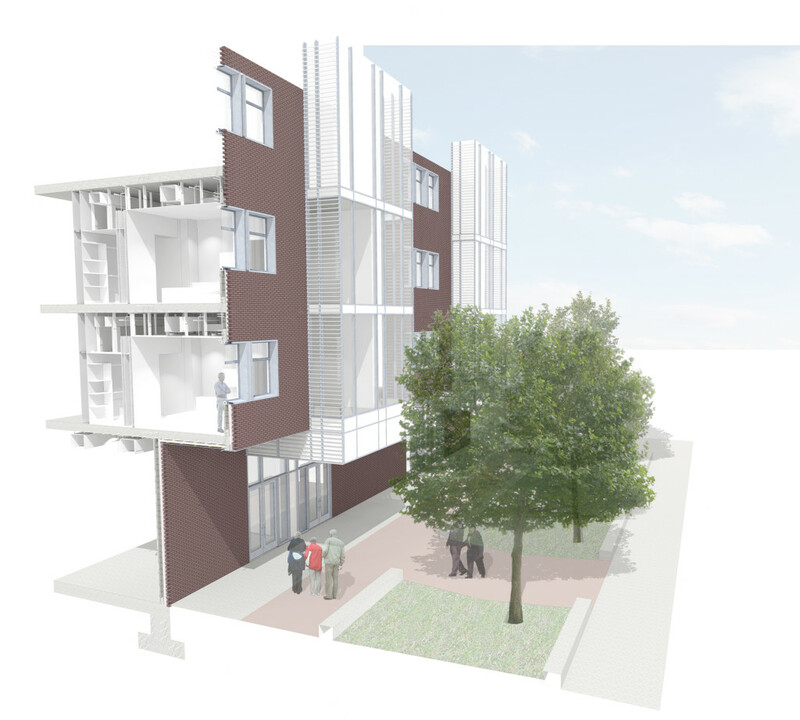 The program of a mixed use assisted living center was located in downtown Birmingham along a new linear park that the class developed. 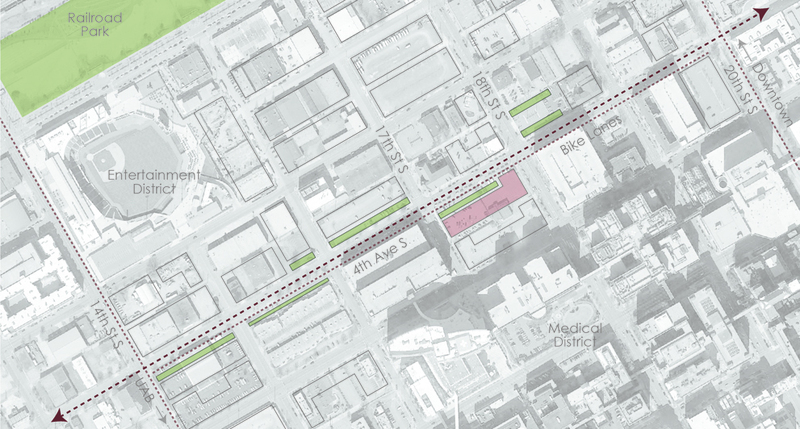 The park system connects two major roads that lead between Downtown and UAB and anchors a new proposed neighborhood between the Medical District and the Entertainment District. 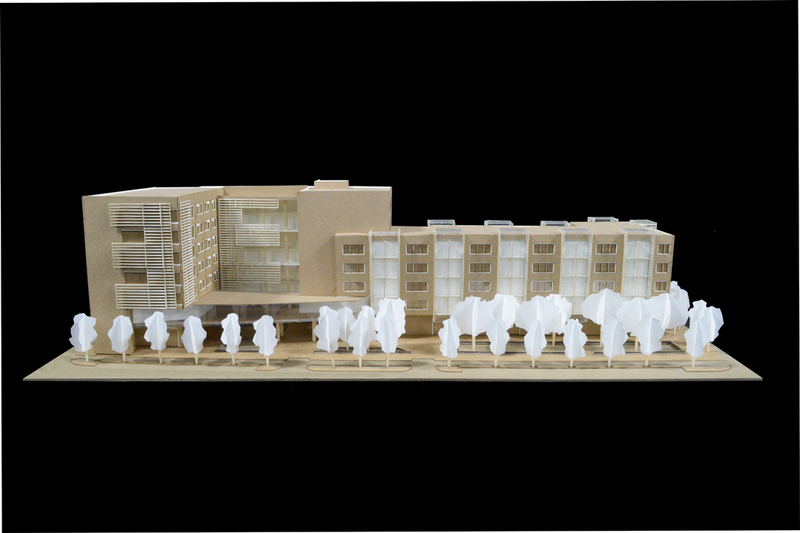 This new neighborhood is populated with proposed mixed use buildings that bring housing back into the city. Bike lanes run along this new connecting road to create a livable area compared to the current industrial zone. 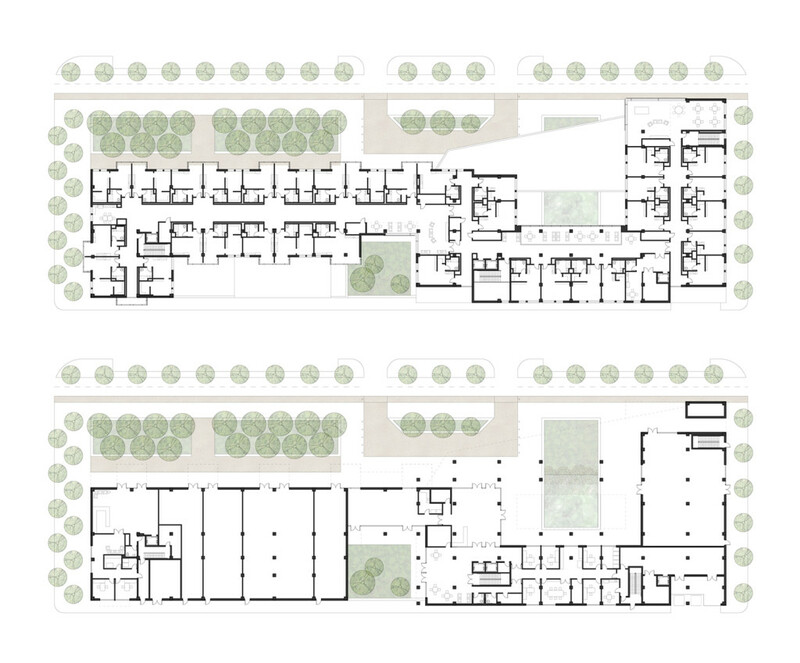 The linear park defined the basic shape of the project because it flipped the traditional form of a rear courtyard. The building became a bar that sits behind the park and then turns up to terminate the pathway. 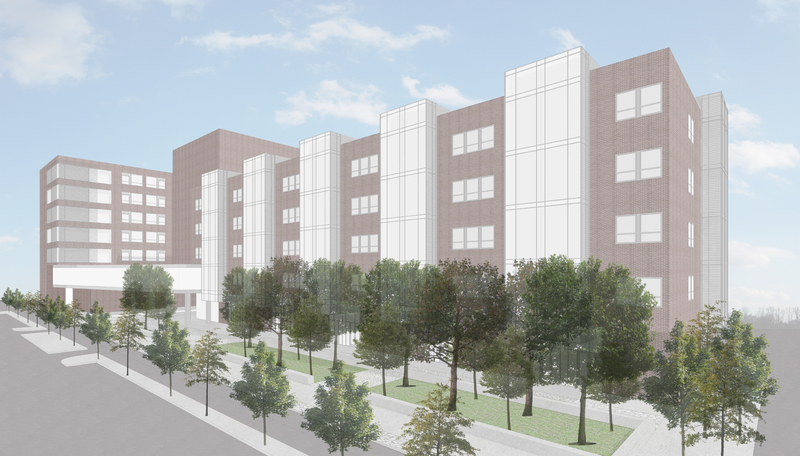 The program was to include both independent and assisted living apartments, gathering and recreation spaces, support and office space, and ground floor retail. 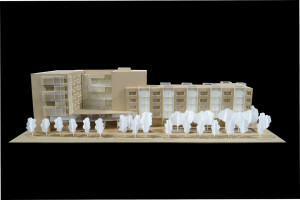 The assisted and independent living areas were separated, meeting at a series of public spaces that serve both groups. The majority of the public spaces for the housing was located on the second floor, above the retail and office ground floor. Each of the two housing types was to have a Studio and a 1 Bedroom floor plan. 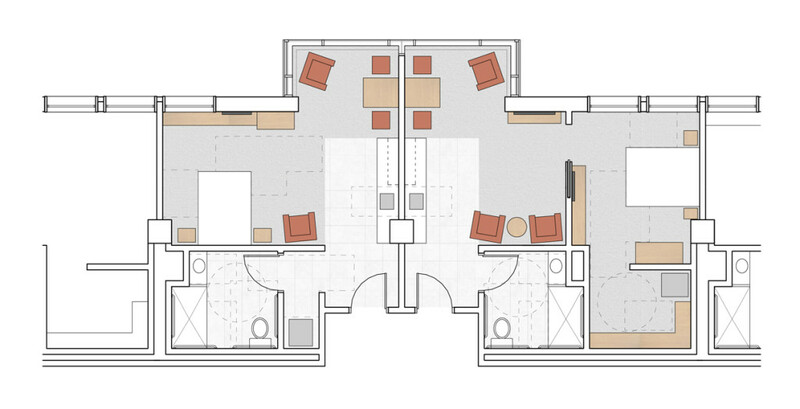 The Independent rooms are larger and include a kitchenette, washer and dryer, and seating area. Circulation and mechanical systems were also divided on each floor. 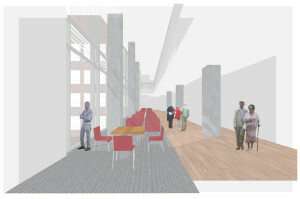 Each of the two legs as well as the retail section has an individual fan room tower that is connected to the main mechanical basement. Each side also has an elevator and primary circulation staircase. The structure is poured in place concrete columns and slabs. The project also required the development of a detailed wall section that accurately showed structure and mechanical systems. The 3D section is cut through the independent living wing of the building, through a brick wall, just in front of the glass slice protruding from the independent living apartments. 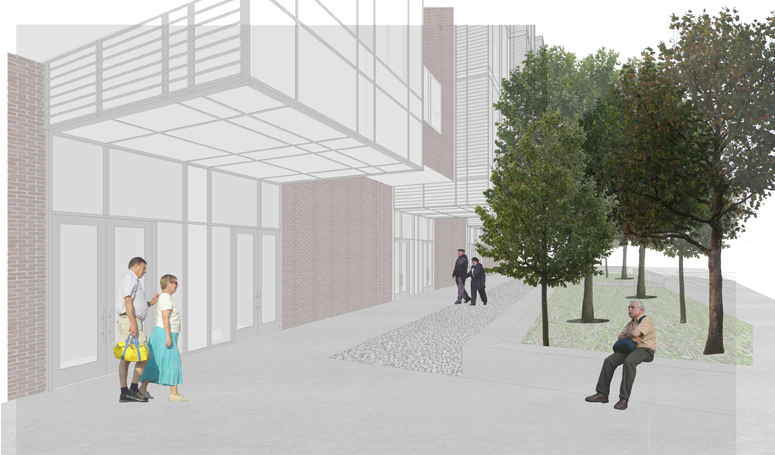 These glass sitting rooms look out to the linear park and the active street beyond to provide connection between the residents and the city. The assisted living rooms are more private but have more accessible public spaces, including large double height gathering spaces that connect pairs of floors. On the exterior, the glass protrusions are the primary element that breaks up the brick facade. 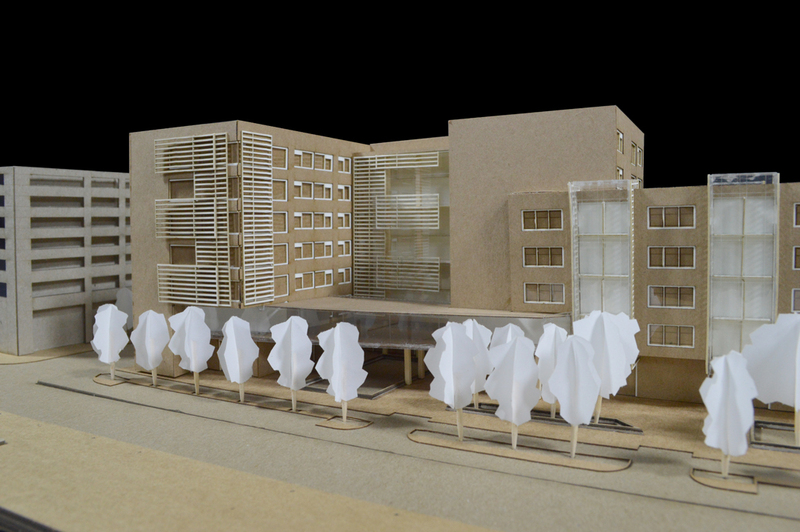 On the assisted living side and the rear courtyard, large screens are placed over the curtain walls and windows to control the light and heat in the gathering spaces as well as add complexity to the facade.